For those looking for an update on the modern role of American unions, the Council of Economic Advisers offers a useful starting point with its October 2015 "Issue Brief: Worker Voice in a Time of Rising Inequality." 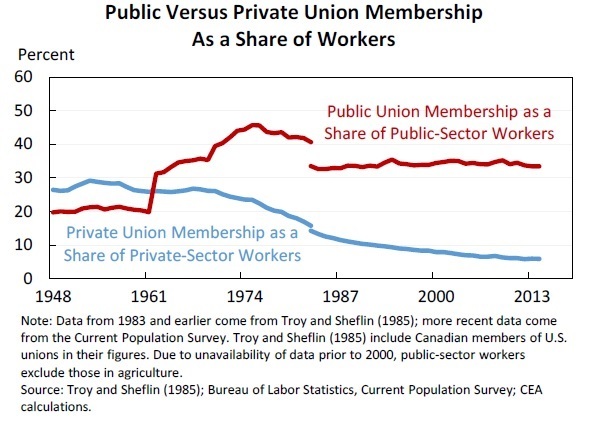 The share of US private sector workers belonging to unions is even lower, while public sector unionization rates are much higher. What effects do unions have in modern labor markets and job conditions? 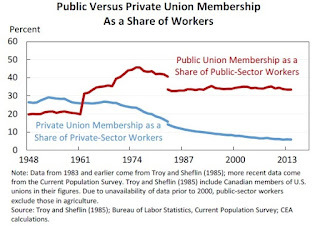 The report notes: "Unionized workers still command a sizable wage premium of up to 25 percent relative to similar nonunionized workers, but that premium has fallen slightly over the past couple of decades. ... After controlling for observable differences between union and nonunion workers, research finds that workers who are represented by a union are about 30 percent more likely to be covered by health insurance at their job than similar nonunion workers. In addition, union workers are about 25 percent more likely to have retiree health benefits than similar nonunion worker ..."
The reason for this wage premium is a subject of some controversy. One possibility is that unionized workers with firms that have large and ongoing profits can negotiate in a way that gives the workers a larger share of those profit--which is a model that fits fairly well with the auto and steel unions of a half-century ago. Otherwise, union workers get paid more because they have higher productivity. This could happen in various ways: less worker turnover, better training, and the like. It could happen because even among workers who look the same based on observable characteristics in the data, the more motivated and productive workers are more likely to join a union. The possibility barely mentioned in this report is that employers react to a union by investing more heavily in capital equipment and in outsourcing to non-union firms, and increasing the pay of union workers in that way but reducing the number of union jobs over time. Although this report has lots of useful information and embeds links to a number of relevant academic studies, reports from the Council of Economic Advisers are inevitably both economic and political documents. The main place the influence of politic shows up here is in the very brief (four sentences, one paragraph) discussion of "Union Impact on Firm Performance." You will be relieved, as I was, to read that unions always have a positive effect on firms. There was apparently no need to mention the possibility that unions might create inflexibilities: for example, in the size of the compensation bill, in a burden of retiree benefits, in job assignments, in limits on incentive pay, or in adapting new organizational or technological approaches. From the discussion in this report, unionized workforces bring nothing but benefits to firms, and so it would seem that every US employer should be lining up to unionize its workforce. I do think one can make a strong case that unions have bolstered productivity and benefited firms at certain companies and in certain countries, at various places and times. But the possibility that unions at other times and places have had negative effects on firms is not not discussed here. But on a number of other subjects, the report gives a more balanced overview. For example, on the question of whether unions improve job safety, the report points out that while one might be predisposed to believe this claim, in fact unionized workplaces seem to suffer more injuries. There are a number of possible reasons for this pattern. Perhaps workplaces with a lot of injuries are more likely to end up with unions. Perhaps unionized workplaces are more likely to keep a true record of workplace injuries. Perhaps the main gain of unions is not primarily a smaller number of workplace injuries, but that the injuries which occur are milder and less harmful. Work on sorting out these issues is still underway. On the question of whether unions lead to improved skills and training, the report cites strong evidence from a number of other countries that this connection exists. But for the US, the report notes: "Other work examining unionized workers in the United States and Canada also finds that unionized workers tend to develop skills that are relatively job-specific. However, some work suggests little to no difference in training between union and nonunion firms, while other research suggests that employers in unionized workplaces offer less training than those in nonunionized workplaces." 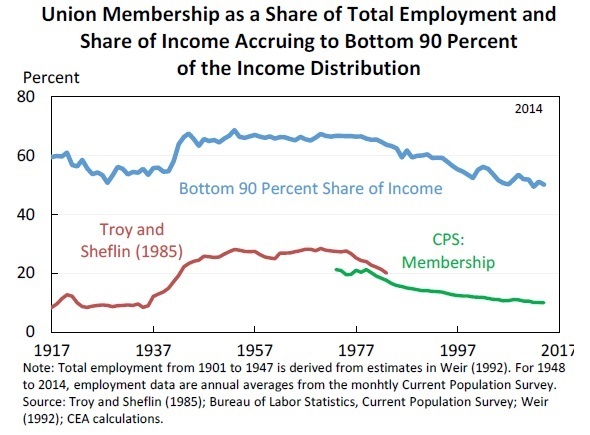 Finally, there is the issue of how much the decline in unionization has contributed to the rise in inequality. 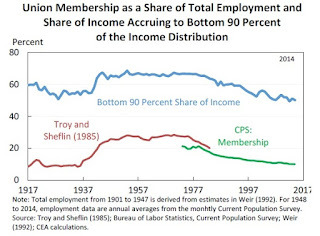 The graph shows the basic observation suggesting a connection here: the bottom 90% of the income distribution had a higher share of total income when unionization rates were at their highest, and the share of income going to that group has declined as unionization rates have fallen. Of course, this correlation doesn't prove causation. 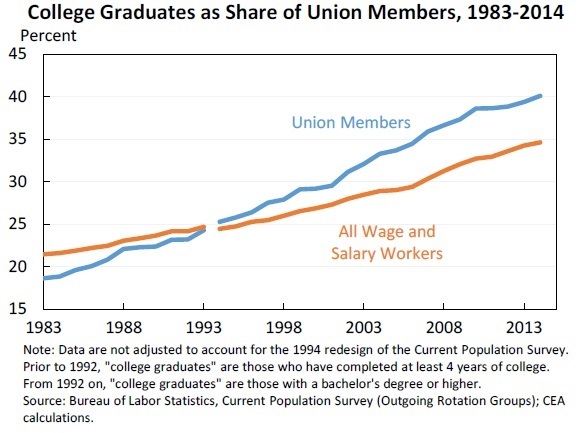 It's easy to imagine that certain factors in the economy--say, the rise in information and communication technology together with an increase in global trade--might account for both the fall in unionization and rising inequality of the income distribution. But more detailed studies that try to take these other factors into account do suggest that the decline in unionization is part of the story, too: "A recent paper finds that declines in unionization explain one-fifth of the increase in wage inequality between 1973 and 2007 for women and one-third of the increase for men. For men, the effect is comparable to the effect of the increasing stratification of wages by education (for women, the effect of deunionization is about half that of education)." 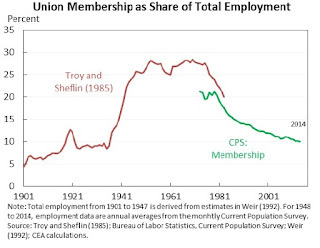 However, give the changes in who is a union member over time, it's not clear that a rise in unionization right now would have a substantial effect on inequality. 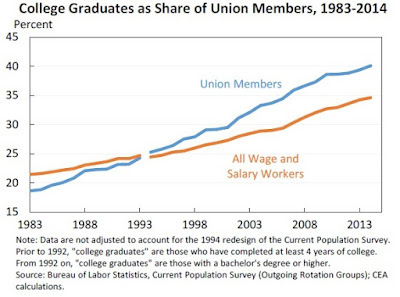 Today's union members are less likely to be low-wage workers; indeed, union workers are now more likely to be college-educated than the average US worker. 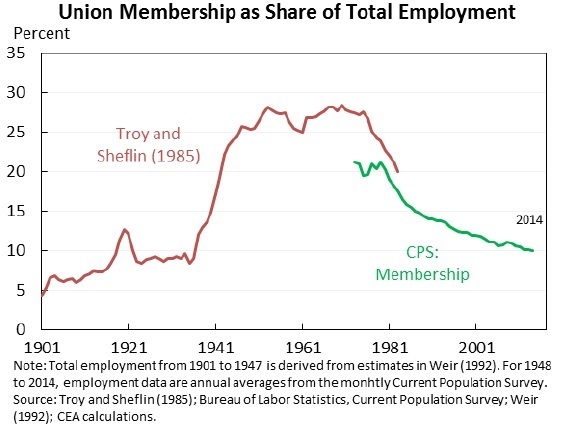 "Union membership has also become more representative of the population, with the share of members who are female or college-educated rising quickly. Studies have shown that union wage effects are largest for workers with low levels of observed skills and that unionization can reduce wage inequality among workers partially by increasing wages at the bottom of the distribution and by reducing pay dispersion within unionized firms and industries. Since both the union wage premium and the coverage of low-skilled workers, who receive the highest wage premium, have fallen, unionization’s ability to reduce inequality has very likely been limited in recent years." Works councils, groups of workers that represent all employees in discussions with their employer but are not part of a formal trade union, are a common form of worker voice outside of trade unions in Germany and, under the authority of the German Works Constitution Act of 1952, can be set up in any private workplace with at least five employees. Works councils ensure that workplace decisions, such as those about pay, hiring, and hours, involve workers – they have both participation rights (where works councils must be informed and consulted about certain issues) and co-determination rights (where the works council must be involved in the decision). Works councils are separate from trade unions: trade unions exist to protect their members, while works councils exist to integrate workers with management into the decision making process. In the US, there are some organizations forming that represent independent contractors and freelancers. A similar organization for workers not covered by the National Labor Relations Act, and that operates closely with the organized labor community, is the New York Taxi Workers’ Alliance. Formed in 1998, the New York Taxi Workers’ Alliance helps advocate for taxi drivers, who are primarily independent contractors rather than employees. The organization expanded nationally in 2011 as the National Taxi Workers’ Alliance, and became the first charter for non-traditional workers since the farm workers in the 1960s, and the first one ever of independent contractors; they are recognized by the AFL-CIO as an affiliate organization. The group advocates for its members in much the same way as a traditional union, but their right to collectively bargain is not protected under the National Labor Relations Act due to their non-employee status. I don't know if these kinds of non-union worker-voice organizations have a real future in the US context. But I do think that worker voice offers potentially valuable input, and that many workers want a voice that can speak on their behalf to management. If workers don't have workplace-related organizations to provide such a voice, they will inevitably turn their voices to politicians who promise legislation to address their concerns.